The seas around the northwest highlands and islands teem with life and we are fortunate that our cruises frequently bring us as close as you can hope to get to the local sea-life. What draws animals of all kind to the area is very much what drew humans to the area: the abundance of fish. Come the spring the seas around the area start to fill with all manner of fish too various to number here, but perhaps the most important is the mackerel, which, on warm summer evenings sometimes seem to throng the bays. And indeed, starting in April, we start to see large bottle-nosed dolphins in the waters around the small isles, but, as we get into May and the summer season, common dolphins visit the area, which seem to delight in coursing and skipping alongside the local boats. Their near-cousins the porpoise, by contrast, is much timid and shyer, but remains around the islands the entire year and further out into the deeper waters, you can spy large pods of them roaming from time to time. During these times it is not uncommon to see Minke whales around the islands, but, in particular, they are to be found feeding in the waters off Muck, thought to be drawn there by a confluence of the tides around Ardnamurchan and the abundance of food around that area. In these warm summer months there comes to the area another giant of the deep: basking sharks. Though these creatures are gentle and harmless filter-feeders, they can still prove alarming at first sight because of their sheer size! Lately we have been seeing much larger species of jellyfish floating into the area apart from the little, purple-ringed moon jellyfish, such as the compass jellyfish, the ethereal-looking dustbin jellyfish and the lion’s mane jellyfish, which, amazingly, is the second-longest recorded animal in the world! Similarly, on our trips of late, we have been coming across large shoals of spurdogs, a species of dogfish shark, suddenly rising from the deeper waters off the islands. Much rarer sightings occur of creatures like the bizarre-looking sunfish and, even rarer still, killer whales and humpback whales. Book one of our adventures for the chance to experience the local wildlife for yourself! As you might expect, the coastal beaches and cliffs of the area are home to a wide variety of wildlife. A glance into any barnacle-encrusted rockpool on any shore should give you an impression of this variety; this is a glance into a floating, transparent world of fluted shells and shards of coral, gobs of glass worn smooth by the tides as lime jelly, blue mussels, mermaids’ purses, violet-spined sea urchins, squashy and bright red sea anemones, green shore crabs and velvet swimming crabs, hermit crabs, winkles and dogwhelks, armoured limpets, starfish, darting shrimp and blennies. In the waters around the coastline we have made a habit of laying down creels to catch edible crabs and lobsters, which ordinarily would not scuttle too close to land. This variety of fish and shellfish is obviously why so many animals choose to cluster around the coastlines, such as families of otters and the common and grey seals that are regularly to be seen on the shores around Loch Nevis. Some seals, though, would seem to prefer for themselves an easier lifestyle and enjoy being hand-fed off the pontoon in the harbour! The area’s coastlines also accommodate a great deal of bird life. Come late July into August, these communities flourish around the islands and Loch Nevis, where you can see gannets diving on shoals of mackerel. Roosting on the clefts around the coastlines you can find sea-eagles, while colonies of puffins can be found nesting on the grassy cliffs on Muck and Canna, Across the water, on Rum, there is, come July, the largest rafting of manx shearwaters to be found in the UK. Down on the shorelines you can find cormorants and shags perched on the rocks like question marks and, on Rum, you can see Eider ducks paddling in the tidal shallows. Drawing back from the sea and the shorelines, the hills and lochs still boast their own wildlife. The area is home to many iconic woodland and highland animals and birds, such as red deer bounding across the hills. Walking alongside the Lochs and their estuaries you can sometimes spot otters scampering in and out of the water. Apart from the various species of waterfowl to be seen paddling and wading there, grey herons commonly make their nests along these waters. Mainland’s local weasels, stoats, badgers like to keep out of sight, but sometimes pop up and you might get to spy Pine martens clambering up trees to hide and shelter from the area’s several species of raptor, such as sparrowhawks, buzzards, kestrels, barn owls and, perhaps most magnificent of all, the golden eagle. Rum’s national park has some things to see that are peculiar to that island alone. For example, on the slopes of Rum’s hillsides you can find wild goats leaping from stone to stone and a population of wild ponies that have been on the island for some one thousand years! 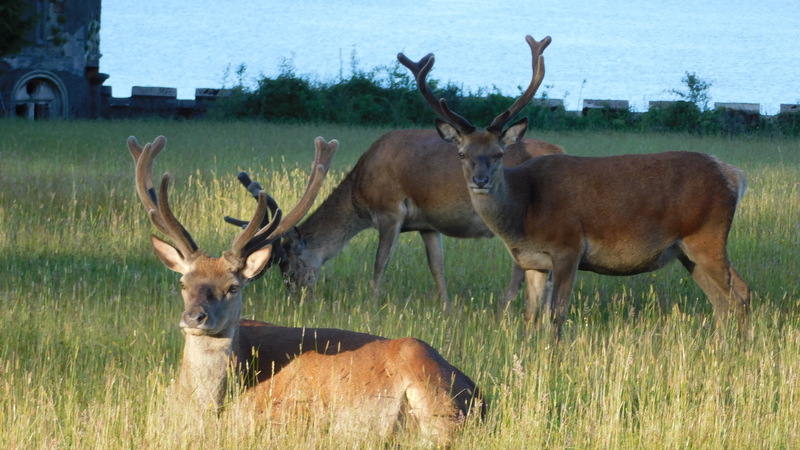 Indeed, Rum’s famous population of red deer has been on the island so long that they are protected by law. The island’s woods, much like those of the mainland, murmur with small woodland birds, but the hill-lochs of the island play home to some rare varieties of waterfowl like red-throated divers, lochs, it might be added, whose peat stained waters abound with magnificent wild brown trout.